« New Mountain Dew flavor decided by the people; And the people, are wrong! Yeah, so I missed another week last week. Crap, I don’t know how that happened. Looks like I picked the wrong week to quit sniffing glue….or did I? Seriously, I did pick the wrong week. Had a lot going on this past week. We went up to Columbia, SC to visit friends Kathy and Himal who have chosen to live up there as they finish their PhDs. We had a blast. They were able to procure us invites to an “insider’s only” party at a place called Jillian’s. It featured free beers and appetizers from 7 to 9pm. Needless to say, we came, we drank, we danced the Cupid Shuffle. It was a grand old time. We finished the evening by stumbling our party-ed out selves over two blocks to the IHop. 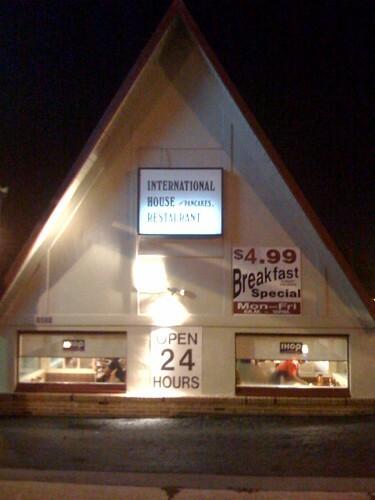 What was cool, was that the IHOP was housed in the old A-frame architecture that the franchise had back in the ’80s. I hadn’t seen an A-frame IHOP in years. There used to be one in Birmingham, AL for the longest time but it was converted into a car wash or something. So that was a blast. What else happened, oh Auburn beat Louisiana-Monroe. It wasn’t the pass-happy offense everyone expected, but I’m hoping that they held back a bit because Louisiana-Monroe wasn’t the strongest of opponents. I also got my allergy scratch test this week. I went into my allergist on Thursday afternoon and they poked and prodded me like a freak of nature filling me with things that I’m allergic to to make me have a reaction. The whole allergy testing thing is interesting because you are laid down on a table. Then the nurse sticks you with like 165 plastic sticks with allergens on them. She then waits ten minutes for the allergens to take effect. Let me tell you, after that ten minutes, there were a few sections of my back ON FIRE! Did they just dip the plastic sticks in Jabenero sauce and put them on my back? Yowza! Not comfortable. After that nastiness was over I had to sit in a chair while she stuck 50-60 needles into my arms while actually injecting allergens into my skin. I felt like a human pin cushion. You can still see the marks on my arms. Here’s pics of what they did to my arms. She marked up my arms with numbers and just started sticking it like some demented Dr Frankenstein. And I swear she enjoyed it. Nurse Marquis de Sade. And it turns out I’m allergic to cats, not dogs, household dust and dust mites, several kinds of tree pollen and mold spores. I’m totally f’d up, dude. Seriously. At least I’m not allergic to grapes or alcohol, because then we’d have a problem. I do enjoy writing in this weekly blog, but I still love the idea of a physical journal you keep with thoughts and insights. So after my allergy test, I stopped by Books-A-Million and picked up a Moleskine journal. It’s a nice black, rounded corner journal that was supposedly used by Hemingway, Sartre and many of the bohemian artist elite back in the day. It’s got a really cool history. It was originally made by a stationary shop in Paris. Artists and writers of the time bought them up in bundles. Eventually the shop went out of business and the notebooks weren’t made for the longest time. Another company then bought up the design and started making them again. The design includes a really cool pull out inside pocket to store stuff. I’m very happy with it and I’m hoping to take it with me and write down thoughts and events so I have a record of my days in which to look back. I kept journals in high school and college but only did it for a year or so and have since lost them. I also kept a journal the first year of my marriage with Steph and gave it to her on our first anniversary. I still have that. It’s fun to look back on. I also had the drafts for both of my fantasy football teams. I’m happy with my lineups so far, we’ll see if that is still true on Monday. So, that’s what went on last week. This weekend, Steph and I travel to Niceville, FL for a wedding. Should be fun, but I’m not looking forward to the drive (I never do). We got an audio book to listen to, it’s Brimstone by Douglas Preston and Lincoln Child. They wrote the book The Relic (which I haven’t read) and Douglas Preston wrote the book The Codex (which I have). I’m looking forward to that, at least. Have a good weekend. Hopefully I can report that Auburn beats Southern Miss this weekend and that my fantasy football team got its first win! This entry was posted on September 5, 2008 at 5:11 pm and is filed under books, humor, personal, random with tags books, fast food, IHOP, Moleskine, personal. You can follow any responses to this entry through the RSS 2.0 feed. You can leave a response, or trackback from your own site. You forgot to mention the tremendous amounts of free shots that we also partook in. (Partook, is that a word?) Anyway, it was too much fun for one weekend! I ought to indignant since I live in Mississippi, but I hate football. You have got to read The Relic! I read it for the first time last month and loved it. Just checkin’ in. I am sure your realize that “Brimston” is the 5th book in the series. They are awesome, but are best read in order.